Of all the people frustrated that the presidential election of 2016 has been mired in details about Hillary Clinton’s emails and Donald Trump’s various offenses against common decency, few are more so than the country’s budget hawks. Like anti-global warming crusaders, they are focused on a problem whose worst effects are years away. And while that makes them no less real, it does make it difficult to get the public to pay attention. Last week, Maya MacGuineas, director of the Committee for a Responsible Federal Budget, teed off on Democrat Hillary Clinton and Republican Donald Trump for not using their public platforms to articulate plans to reduce the growth of the national debt. “Ultimately, tough choices need to be made and unfortunately both candidates are shying away from that reality,” she wrote. “We deserve credible solutions to our fiscal challenges, not wishful thinking on economic growth. Current and future retirees deserve answers on how the next president would shore up our social safety net for generations to come, not easy fixes that kick the can down the road. 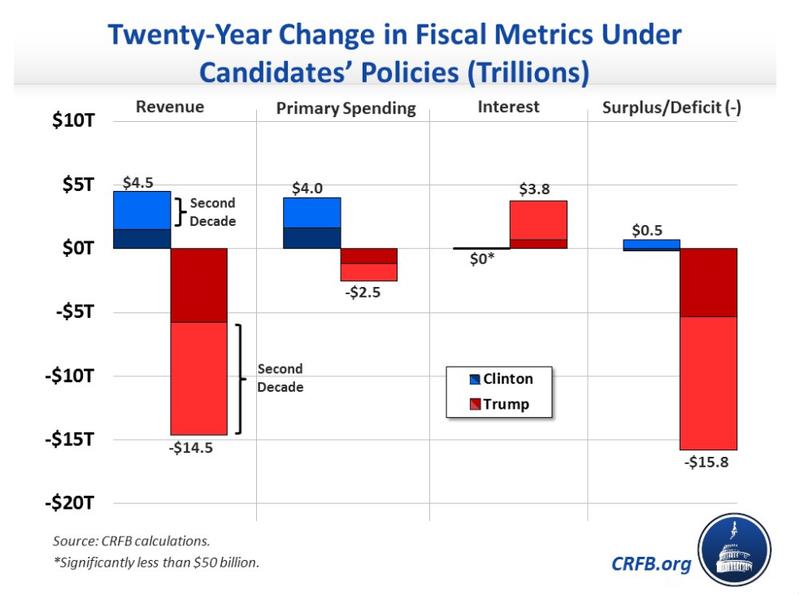 Absent a plan from either of the candidates to reduce the debt, researchers at CRFB have been closely tracking the effect that each of their other economic proposals -- taxes, spending, trade, etc. -- will have on the future debt. As a recent report indicates, in neither case is the answer good. Neither candidate proposes actually reducing the federal debt. On the contrary, it continues to grow under both of their proposals. But one is much worse than the other. According to their latest calculations, over a 20-year budget window, Hillary Clinton’s proposals would result in an increase in federal revenue of about $4.5 trillion. This would be relatively good news for the federal debt, except that she also proposes to spend all but $500 million of it. Trump’s plan would slash federal revenue by $14.5 trillion over the same period, offset by only $2.5 trillion in spending cuts. Trump would also add $3.8 billion in interest payments to cover the additional borrowing necessary to make up for lost tax revenue. The budget hawks’ frustration is evident in the report’s conclusion. 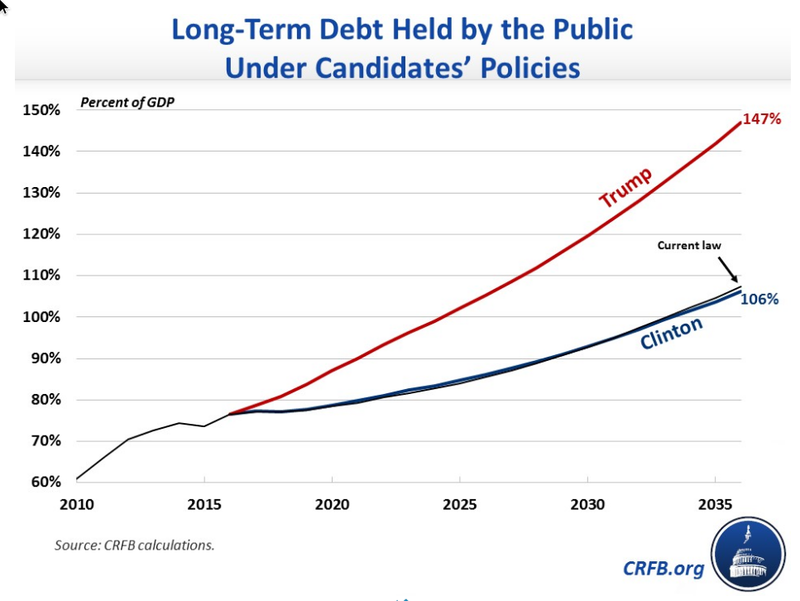 “While only Trump would massively increase debt levels above projections, Clinton’s plan would do little more than pay for her proposals, and thus neither candidate would slow the unsustainable growth in the debt,” CRFB complains. “Even stabilizing the debt at today’s post-World War II era record-high levels would require significant tax and/or spending adjustments and would likely require a particular focus on entitlement reform over the long run.